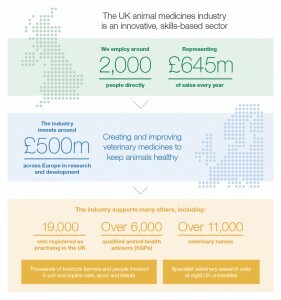 The animal health sector is an innovative, high skills-based sector; NOAH members – who make up around 95% of the UK industry – employ around 2,000 people directly in the UK and indirectly support many thousands in related industries. NOAH member companies account for a total of around £645 million in annual UK sales of authorised veterinary medicines, at ex-manufacturers’ prices, net of all discounts. This figure is based largely on companies who participate in the NOAH/CEESA independent sales survey, plus a smaller number who provide their sales data separately. This figure is estimated to be around 95% of the total UK market. Endectocides: prevent and treat infestation of both endo- and ectoparasites. Other therapeutic medicines (including anaesthetics and other products acting on the nervous system; medicines for digestive problems; cardio pulmonary therapy; geriatric medicines and medicines to treat or prevent specific dietary deficiencies, as well as a number of other niche medicines). In 1986, when NOAH was formed, around 70% of animal medicines were used in farm livestock. Now over half animal medicine sales, by value, are for companion animal use. While farm animal numbers have declined, British farmers are still investing in the health of their livestock, particularly in the vaccine sector. The species split is particularly indicative of exciting new product developments in the companion animal sector – Britain’s pets have every opportunity to live long and healthy lives. The following abbreviations in the chart relate to the four different legal categories under which authorised veterinary medicines can be sold in the UK under the Veterinary Medicines Regulations (VMR). POM-V: Prescription Only Medicine – Veterinarian. A veterinary medicinal product which may only be supplied to the client once it has been prescribed by a veterinary surgeon following a clinical assessment of an animal, or a group of animals, under the veterinary surgeon’s care. POM-VPS: Prescription-Only Medicine – Veterinarian, Pharmacist, Suitably Qualified Person (SQP). A medicine for food-producing animals (including horses), to be prescribed by any Registered Qualified Person (RQP means a veterinarian, pharmacist or an appropriately qualified SQP). A clinical assessment of the animal(s) is not required when prescribing this category of veterinary medicine and the animal does not have to be seen by the prescriber. However sufficient information about the animal and the way it is kept must be known to the prescriber in order to prescribe and supply appropriately. NFA-VPS: Non-Food Animal Medicine – Veterinarian, Pharmacist, Suitably Qualified Person. A medicine for companion animals may be supplied by any RQP (a veterinarian, pharmacist or Suitably Qualified Person) provided the requirements for supply are met. These medicines do not require a prescription. AVM-GSL: Authorised veterinary medicine – general sales list. There are no legal restrictions in the VMR for the retail supply of veterinary medicines as AVM-GSL, but a responsible approach to the supply of these medicines is still expected. All medicines for food-producing animals need to be prescribed, according to their legal category (so are POM-V or POM-VPS). All antibiotics, whether for food producing or companion animals, are classified as POM-V and are only available under prescription from a veterinary surgeon. Exemptions for Small Pet Animals (ESPA): Certain medicines can be placed on the market without a marketing authorisation (MA), subject to certain conditions. This exemption applies only to veterinary medicines labelled exclusively for use in one or more of the following animals that are not intended for human consumption: aquarium animals (including fish kept in closed water systems), cage birds (meaning birds kept in cages or aviaries), homing pigeons (meaning pigeons kept for racing or exhibition), terrarium animals (meaning reptiles, amphibians and arthropods kept in tanks and cages – including animals free-living in domestic gardens), small rodents (meaning domestic mammals of the order rodentia), ferrets and rabbits.